Hi everyone! I'm Linda(LIV) and a newbie at least to SFG. I'm located in the central San Joaquin valley zone 9a. We always had a garden growing up and when I bought my first house last year I knew my first project would be a garden. Of course suburban life comes space limitations and my attempt at traditional row gardening was marginally successful. I took to the internet and found SFG-EUREKA! Even better I found this forum and started my first SFG this year with 3 4x4 and 1 1x8. So far, so good. I am by no means an expert on any of this, but i'm a good student and find learning from others mistakes is often easier than making your own. I have documented my journey this year with journal and lots of pictures. My hope is to learn as much as possible and create lesson plans to use with children. So here I go. Well, it's not Tuesday, but I finally have a good tomato ready! I don't see a tomato Tuesday for So. Calif, so I'll post here The variety is called "Ace". It kinda stopped growing heightwise, but this is a beautiful tomato!! Looks good. 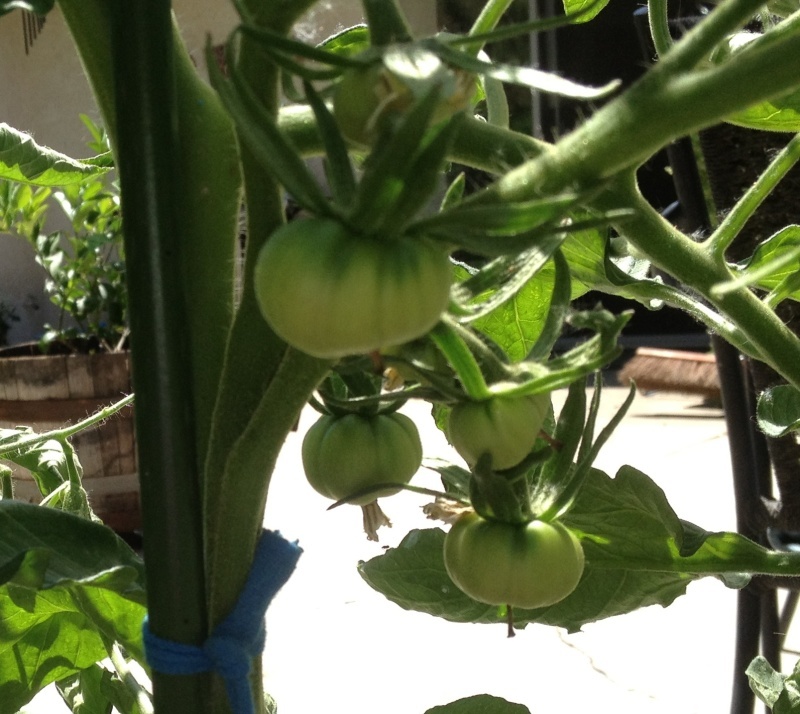 Mine kinda stalled through the triple digit temps, but seem to be ripening up again. Beee-utiful Southern Gardener! Can't wait until I have my first blushing 'mater! Finally, I'm on the right day!! Here's the batch we hauled in yesterday...the one on the scale is 1lb 4oz and the other large toms in the two containers are either just over or barely under 1 pound each. They are as yummy as they look! I am green with envy! Mine have gone into hibernation because of the triple digit heat as well. I also started late but hoping for a bountiful fall season as we don't get frost until late December/ early January. The only problem with such bounty is figuring out what to do with all of them!! What isn't showing in this photo is the other container of the San Marzano and Roma toms...a really BIG container! I made marinara sauce yesterday, made the house smell delicioso and now it will be in freezer bags for winter meals. I am my gardens worst enemy. @PNG_Grandma wrote: The only problem with such bounty is figuring out what to do with all of them!! What isn't showing in this photo is the other container of the San Marzano and Roma toms...a really BIG container! I made marinara sauce yesterday, made the house smell delicioso and now it will be in freezer bags for winter meals. Do you know if you can "blend" them up in a Vitamix blender and make sauce? I'm hoping to get enough to do this. I saw a video on utube, but didn't know if anyone here has tried it? @southern gardener wrote: Do you know if you can "blend" them up in a Vitamix blender and make sauce? Thanks for sharing that...we have a Vitamix blender and if you knew my husband you'd be saying "Gee, what a surprise"
I'm gonna try a tomato soup and I'll definitely use the Vitamix blender to smooth it out! 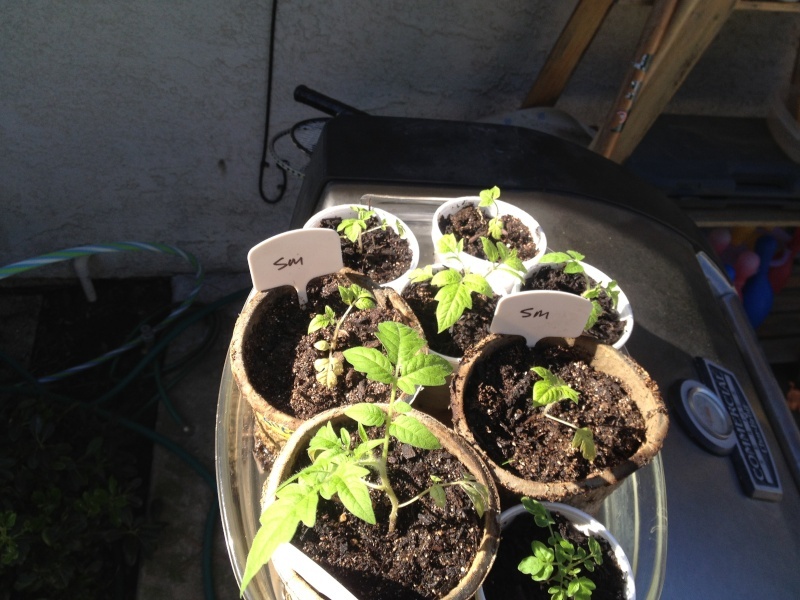 I have a total of 8 tomato plants. I have only one small green tomato on one of them. 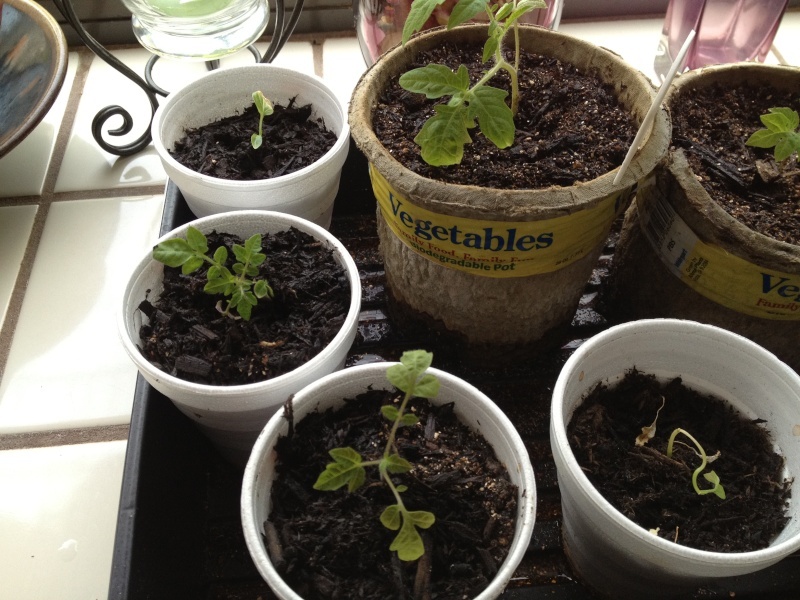 @mrsfish94 wrote: I have a total of 8 tomato plants. I have only one small green tomato on one of them. One word: WEATHER! Even here in South Dakota the weather has been too hot for tomatoes. I got my plants outside over a month earlier than usual because of our early spring. 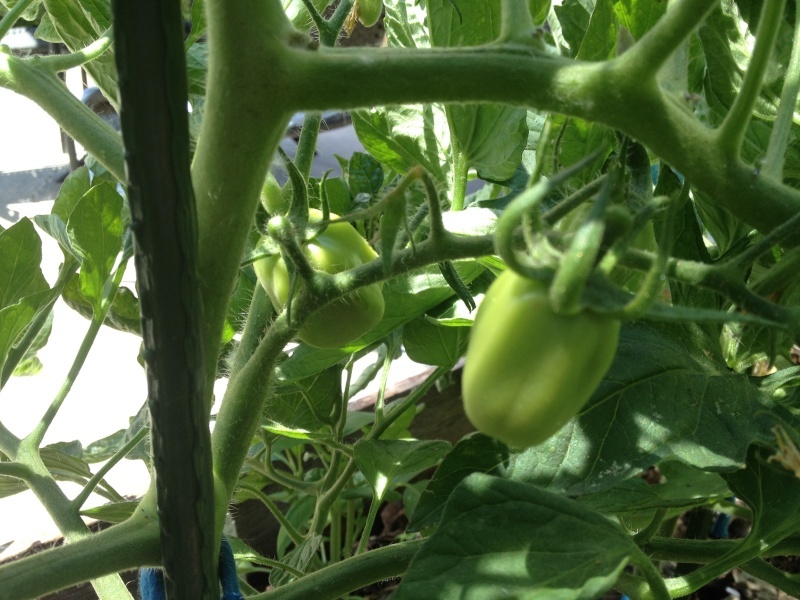 It has been extremely hot much earlier and much longer than usual and so my tomato plants are only half the height they usually are by now and are just now starting to get a good fruit set since the temps have cooled to the 80's this past week and the humidity has dropped. 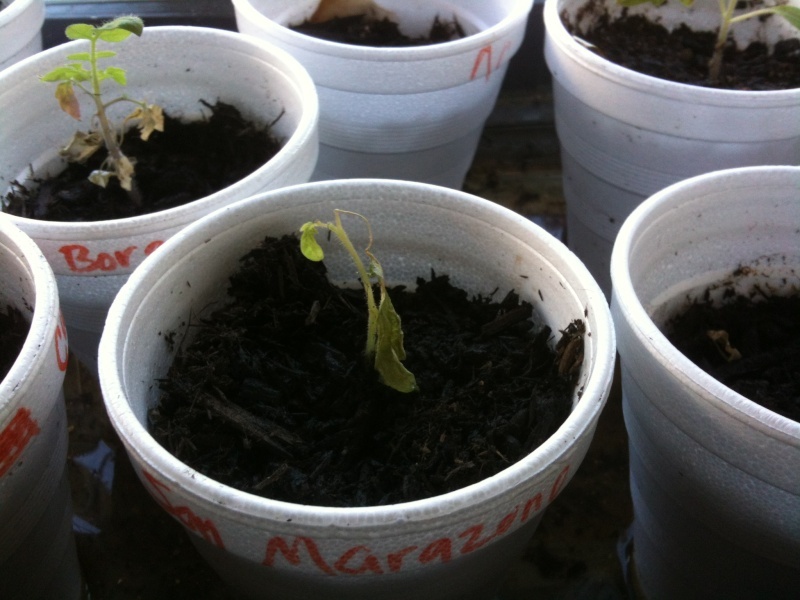 They are the healthiest, strongest tomato plants I have grown out here, but just a bit stunted because of the weather. Thought I left triple digits behind when I left CA! If it stays cooler for a bit they may just catch up. I should have my fall broccoli starts in the ground but it has just been too hot for them to survive out there. Maybe in the next week or so I can get them in the ground! I found that some sort of fertilizer has really helped mine produce. 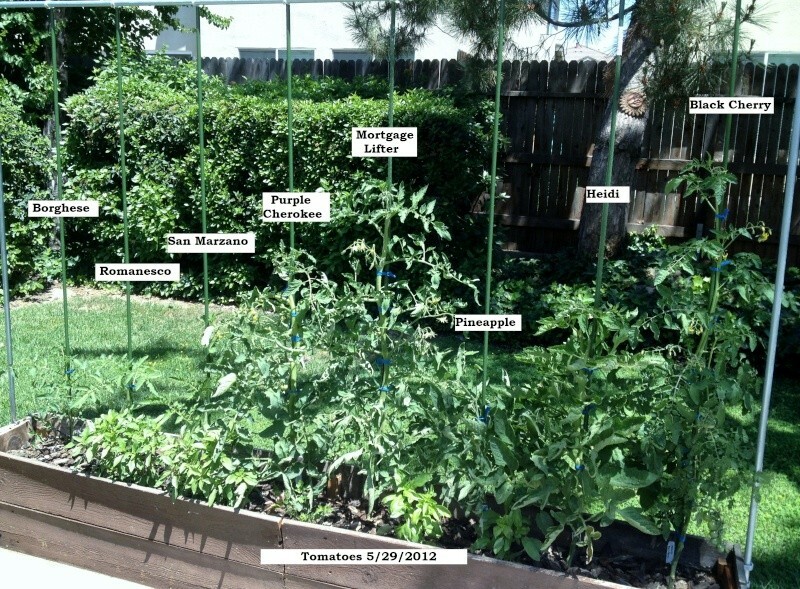 I use a fish fertilizer on the tomatoes as well as worm castings and someone here suggested that banana peels were the perfect fertilizer for tomatoes. Do you have a favorite fish emulsion that you use? Well, it's not Tuesday, but here are the last of our toms...and a few peppers. 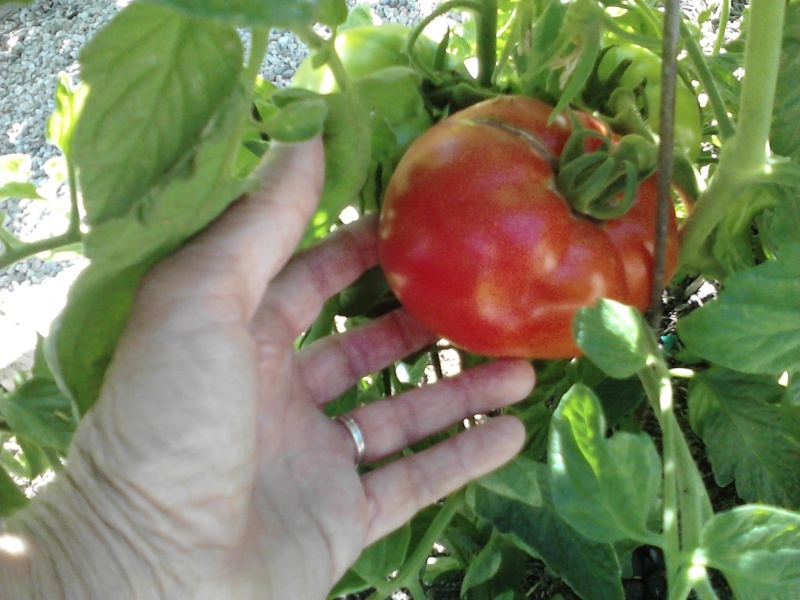 This last big guy, a Beefsteak might not look so pretty, but boy was it yummy!! All the toms still growing have odd shapes, a bit wrinkled, some with holes pecked from the birds...but they're still growing! The peppers and the eggplant is still producing too. Amazing things happening here in the California Central Valley!! 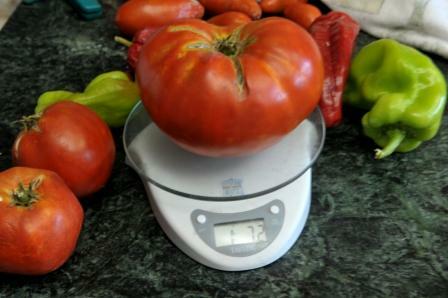 ...and the scale reads 1 pound, 7.2 ounces. Yep, he was a big guy! Flaws and all!! I asked this question on the other forum...but I thought here might be a good place too. 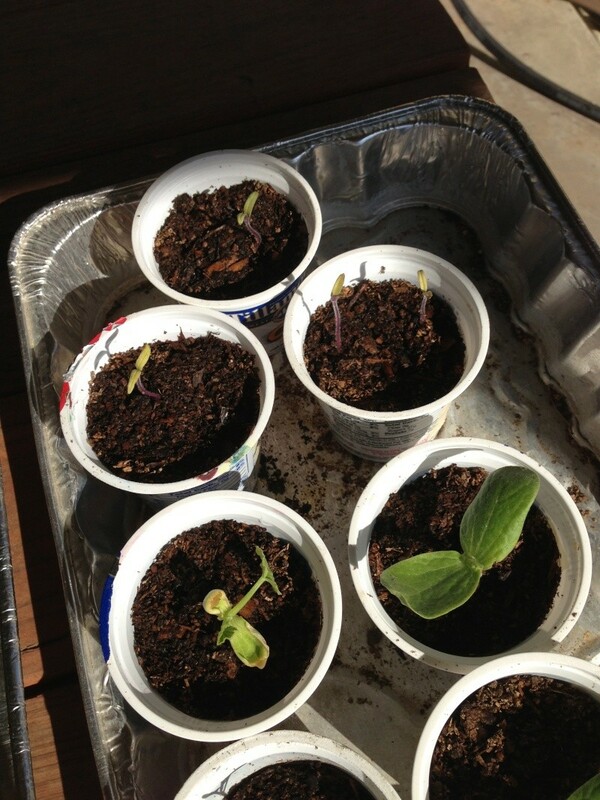 My tom seedlings are stuck. grr.. They were started on Jan 19 and should have true leaves by now. Any advice or suggestions? Could you give some more info. 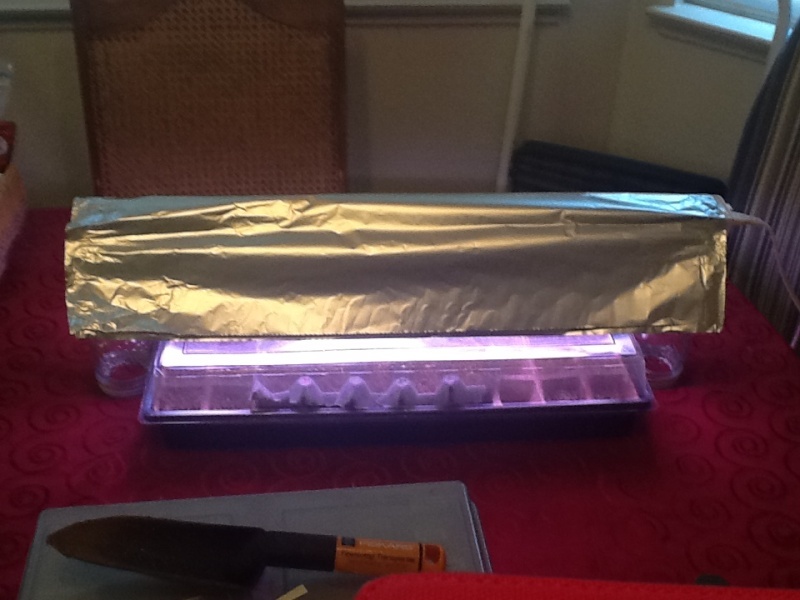 How much light they get, how warm is the area that they are in, are they moist but not wet? the answers would help out. they are in full sun on my back patio under the porch. I cover them at night with a clear cover ( I have them in a foil lazanga pan with a clear plastic lid) Our weather has been pretty good. In the low 60's but we have had freezing temps at night. When it gets really low I bring them in. I check for moistness every morning and afternoon. If they need water I give it to them. The link above has a picture of them and the containers they are in. I couldn't get the site to actually post the picture...so you have to go to the link to see it. I bet they are just a little cold. lol. they just take forever it seems like if they are cold rather than if they are in a warmer place. They did look like they were a little yellow too. @mrsfish94 wrote: I asked this question on the other forum...but I thought here might be a good place too. What kind of mix are they started in? Do you have drainage holes in those cups? I would suggest using a weak solution of compost tea to see if that perks them up.